Pancake Day is coming. There is some good news for all of us. Low carb pancakes exist J I tried the recipe with soy flour and I’m very happy with the result. The proof is that I ate four in one go! If you don’t want sweet pancakes add pinch of salt instead of fructose. 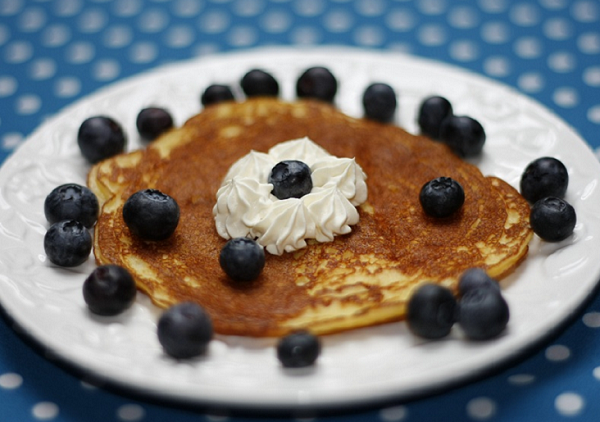 1 plain pancake without topping contains about 1.8g carbs. 1. Mix all the ingredients well and allow the batter to rest for 10 minutes. 2. Heat small amount of olive oil (1 tsp. or using olive oil in spray is quite handy) on the medium heat. Pour about 2 tbsp. of batter on the hot pan and spread evenly. Pancakes should be about 10 cm in diameter. 3. Fry about 30 second each side until golden brown. 1. Using electric hand mixer whisk cream with fructose until the cream gets thick. 2. Serve the pancakes with about 1 big tsp. of whipped cream and 1 tbsp. blueberries.